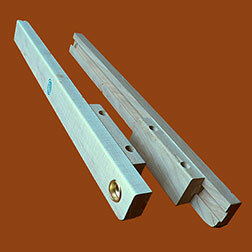 X291934 L&R Hand Wooden Pull Out Table Drop Leaf Supports, enough for one leaf. Small part is attached to underside of the table. Long part slides outs to support table leaf. Small Brass Cup Pull on the side assist user in pulling out slide. Photo shows 3 views, long side with brass cup pull, small side which attaches to table and top view of the slide. Long side of the slide is 19-3/4 inches long. Sort side of slide is 5 inches long. Each side is 1-3/4 inches high and 7/8 inches thick which means the two sides together are 1-3/4 inches thick. When installed the slide come approximately 12 inches to support the leaf. This pair of slide out supports replaces W-5137. Enlarge views shows more detail.